G-CAS! Sew Excited! : Unselfish Sewing! A Dress For Mom! Unselfish Sewing! A Dress For Mom! This is my Mom. . .
We attended a special wedding this past weekend. My mother's relationship is Grand Aunt to the Bride. The Brides Grandmother is my Mom's baby sister (my Aunt) so, for this grand and happy occasion, I knew my mom would want to be stunning for this out of town event. With that in mind, I offered to make her dress. (yes, I offered). I asked her what color and to my surprise she said "Fuschia"! Well my search began and I came across this double sided fabric and fell in love. (I did). I showed it to my mom and she was a little taken aback. "It's so bright!" she said. But then it started to talk to her (like it did to me) and she was soon on board. I didn't have to persuade her to move forward. 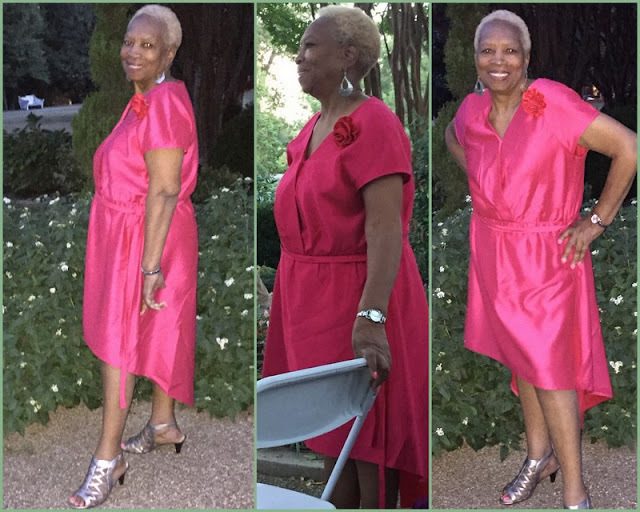 She decided on Vogue 8870 (a dress I made for myself that she really loves). Since my mom is 76 yrs young, I had to modify the pattern just a bit for her liking. She's jazzy but,she does get cold. (LOL!!) So we opted for the exaggerated hi/low (with modifications) and short sleeves. (A&B) When I was done with the dress, I felt something was missing. How do you jazz up a super duper bright frock without over doing it? 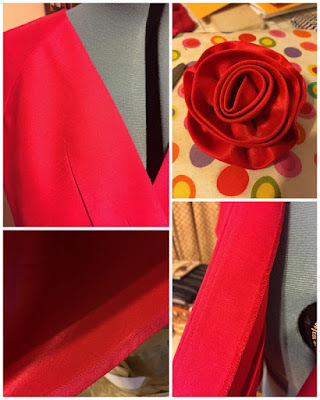 Add a fabric flower and a perfect but simple fabric belt. It totally made the difference. 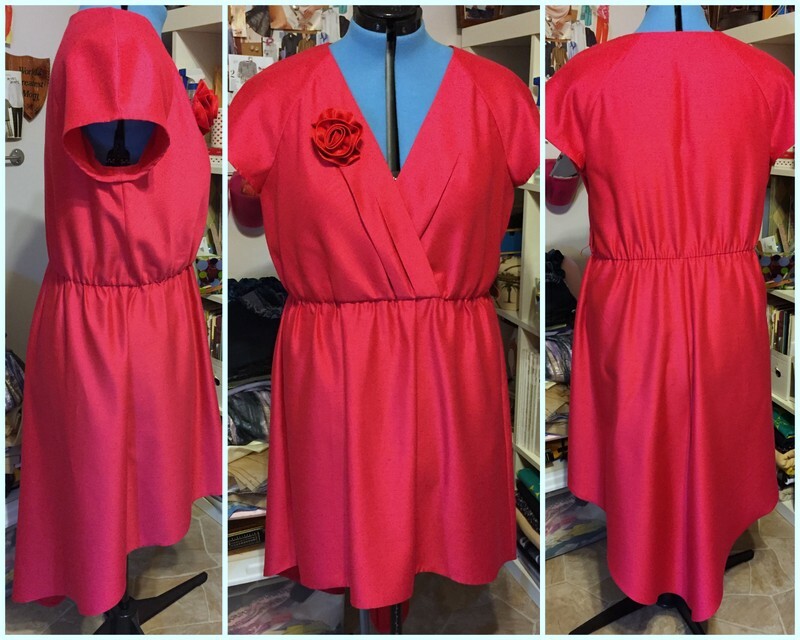 Since the fabric was double sided, the inside of the high/low is RED as and so is the fabric flower. I also added red thread chain belt loops. 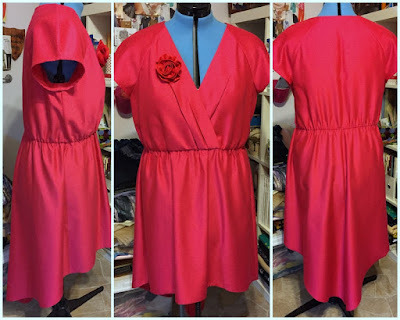 Here's a demo video of how I made them, and instructions from The Vogue Sewing Book! These Pics are so true to the real fabric color! When she walked, the place lit up - just like her! We had a wonderful time and it was so good to see our family in attendance at the wedding! This was the best unselfish sewing ever! Mom really loved her dress. I figure she gave and gives me life, I can return the favor errrr now n din! ROFL! She asked for 8 more dresses! Thanks Ms. Faye! She really looked pretty and enjoyed the dress! Your mom is beautiful. She IS really lighting up your post and its not the dress. It's her. You Did That!! She looks FABULOUS!! Your mother is absolutely beautiful,Carol! This dress looks amazing on her! Awww! Thanks Candice! She wants one in "every color"! She just turned 77 yesterday! It was her birthday! She doesn't age! I always love your tips. Thanks Lara! You are why I do what I do!